I've been out of the water for a long time (I'll spare you the list of excuses why). I figured that when the weather warmed up and I could swim outside again, that I would find the motivation to get back to it. A couple guys have been going out to GSL about once a week for the past few weeks, and I just haven't been able to make it until today. I had a stressful day at work and thought I might not make it, but it all worked out and I headed down to the lake this afternoon. It's been so long since I've been out there. It's exciting to see people milling about and taking pictures of the lake. I started getting really anxious to get in the water, which was pretty flat and looked really inviting. I got ready to go and was hung out at the bottom of the ramp until Sam got there. I had looked online as saw that the water temperature was 54 degrees. That's a bit chilly, so I was planning on just floating around a bit. Once we got in the water, it actually felt pretty good. We swam out to the first buoy and decided to keep going to the next red buoy. I looked at my watch thermometer and it varied between about 63 and 64. It felt nice on the surface, but was colder a few feet down. At the second buoy, we were both feeling great and decided to go on to the third buoy. At the third buoy, we turned around and headed back. Seeing the mountains and clear skies as I took a breath reminded me how much I love swimming outside. The swim back seemed to go much faster. As we got back into the marina, the water temperature dropped significantly. We talked to a couple from out of town for a bit and then went and got rinsed off. I always seem to run into interesting people out there. This couple had been to every state and were working on visiting every capitol. I think they said they only had a few left. I left feeling really excited about getting back in the water. I freaking love swimming at the Great Salt Lake! Also, I tried out the New Wave Swim Buoy for the first time. I love it. I will write a separate post about it soon. 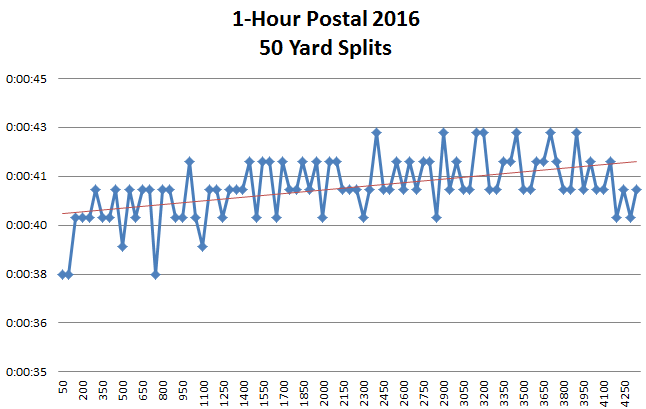 The annual USMS 1-hour postal swim kind of snuck up on me this year. I had been out of the pool for about a month and didn't feel like I was in shape enough to make a good effort. I wasn't even going to do it, but my friend Chris talked me into it and her husband Mike was nice enough to time us both. 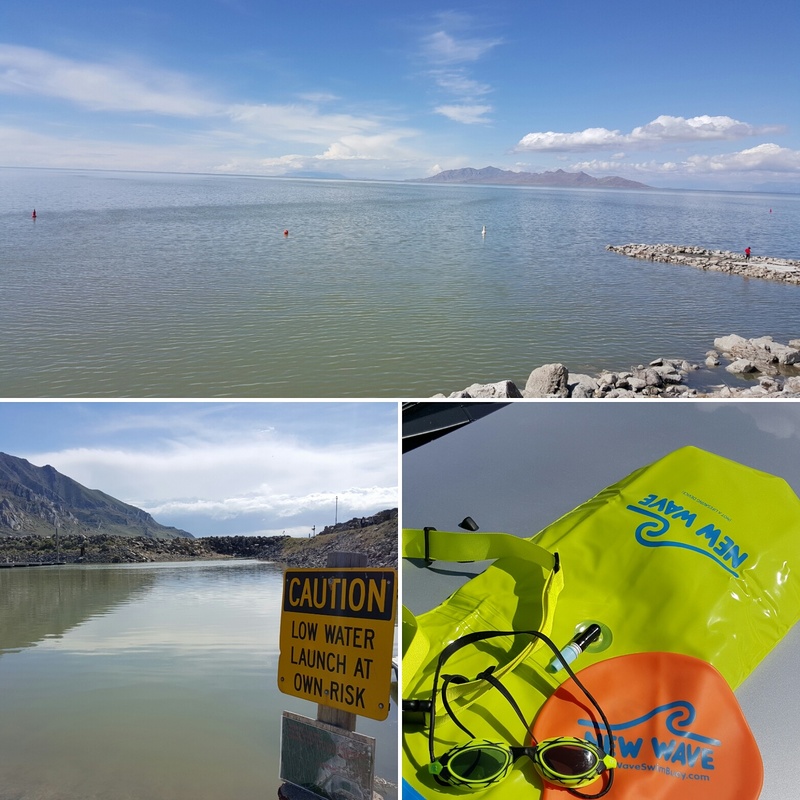 We did the swim at Olympus, which is a really nice pool. There were a bunch of other people from the Olympus club swimming the 1-hour postal at the same time and it was fun to be doing it as part of a big group. I felt pretty good for the first 1,000 yards, and averaged a 1:20 per 100 yard pace. After the first 1,000, I started getting a little tired and felt like I was going slower. Sure enough, my second 1,000 yards averaged 1:22 / 100 yards. I averaged 1:23 / 100 yards on the third 1,000 and 1:24 on the fourth 1,000 yards. I chose to wear a cap, which I don't usually do, and it was giving me a headache. It was bad enough that it was distracting me and I kept thinking about stopping to take it off. In the end I decided to just keep going. When I finished, Mike told me I had done 4,400 yards plus about 37 yards. I couldn't believe it! That was only slightly less than I did last year when I was in much better condition. I submitted my results to USMS and was feeling pretty good about my swim. However, when I plugged the splits into my spreadsheet, I noticed an error. Since Chris and I were both swimming in the same lane, I think Mike accidentally recorded a split on my sheet that shouldn't have been there. It was pretty easy to see where the mistake was because it showed a 50 split at like 12 seconds (which is impossible) and all of my other splits were between 38 and 43 seconds. I made the correction and contacted the event organizers to adjust my yardage in the final results. So, long story short, my actual 1-hour distance was 4,380, which makes a lot more sense. I always like to do some analysis on my splits afterwards to get a better idea of my pacing was like. In this case, it revealed that my conditioning isn't where I would like it to be, and I kept getting slower rather than holding a steady pace all the way through. And here is the graph of my 50 yard splits. The trend line shows that I was getting slower over time, going from 38 seconds near the start to 43 seconds near the end. This compares to last year when I was in pretty good shape, and I actually got slightly faster during the 1-hour swim with an average pace of just under 1:21. Anyway, I'm glad I did it and it gives me motivation to get back into shape for the 5K and 10K postals that are coming up next.